8 Panels: Each Panel measures H39"xW23" or H99 x W58.5cm. 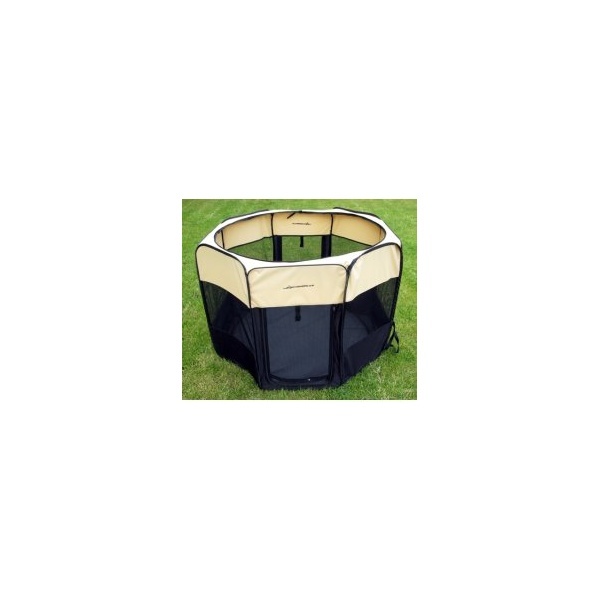 This is a wonderful and stunning 2 Door 8 Panel Pop-Up Puppy Play Pen made from high quality water resistant 800 Denier Polyester Fabric with supreme PVC coating. Each playpen consists of eight panels. The playpen comes in a Stylish Jet Black & Cream Colour combination looking smart and presentable in any home or garden. The base of this playpen is zipped and therefore removable for easy cleaning. As the material is extremely water resistant, these puppy playpens are ideal for indoor as well as outdoor use. If puppies have a small accident in the playpen, this will not leak through to your carpets making these playpens ideal for your living room to socialise your puppies. You can either mop up the accident or remove the whole base to wash it. On the other hand, if you put these play pens out in the garden onto wet grass, your puppies will stay happy and dry whilst being able to observe the wildlife in your garden, you can remove the base so they can have their first feel of grass. All puppy pens (both sizes) come with their individual carrying case, which means that these are incredibly portable and handy for any dog owner. These are lightweight puppy pens and all six panels fold flat into one small packet due to an extremely flexible and lightweight steel frame. You then simple pop your small 'puppy pen parcel' into your carrying bag. There are two doors with heavy-duty zips, which allow you to put the puppies into the playpen (each door measures approximately 20 inches in height and 17 inches in width). The lip to each door from the ground only measures 1.5" in height. You can also lift them in and out of the playpen without using the doors. All playpens come with a zipped waterproof and sun-reflective top cover, which is removable and also water resistant. Each of the eight panels has a strong mesh window, which allows your puppies or dogs to have a clear view out of the playpen and have superb airflow at the same time. Absolutely ideal for the summer with its sun-reflective cover. 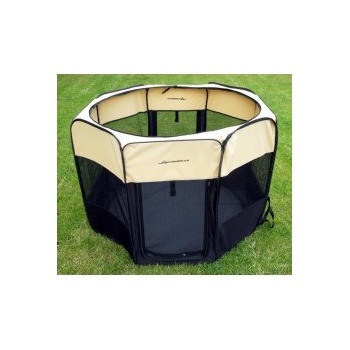 This can be used for small puppies and also small to large breed dogs due to its height.